We've discussed a number of Hebrew colors in the past - let's take a look at one less commonly used: tzachor צחור. 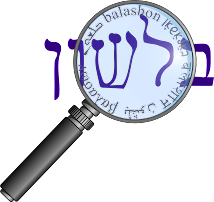 In the Even-Shoshan concordance, there are two appearances of the root צחר. Once he lists it as an adjective meaning "white"- in the phrase רֹכְבֵי אֲתֹנוֹת צְחֹרוֹת (Shoftim 5:10) - so he would translate it as "riders of white donkeys". The second phrase, from Yechezkel 27:18 has the word צחר tzachar as a noun in the phrase וְצֶמֶר צָחַר, which he defines as "and wool of white". A similar word is the name Tzochar צחר, who is both the father of Efron (Bereshit 23;8, 25:9) and one of the sons of Shimon (Bereshit 46:10, Shemot 6:15). Kil, in the Daat Mikra commentary (on 46:10), quoting the verse from Shoftim, says the name is related to the concepts of whiteness and light. He says that the root is related to the root צהר - "to shine" (see our discussion here) and to the root זרח (which we discussed here), with the last two letters switched. A proof of a connection between צחר and זרח is that in Bamidbar 26:13, Shimon's son is listed as Zerach instead of Tzochar1. (We also mentioned in this post that Steinberg connects the roots שחר, צהר, זהר and צחר as all meaning "to shine", but he can be a bit liberal with his association of roots, so we should be cautious about accepting them). Neither too tall nor too short; neither too small nor too fat, neither too white [tzachor] nor too red [gichor], neither too smart nor too stupid. Strangely, Rashi says here that tzachor means red (צחור = רו"ש, using the Old French word for red, ros) and that gichor means exceedingly white. This is despite the fact that Rashi in his commentary on Shoftim and Yechezkel identifies tzachor as "white", and in his commentary on a later passage in Berachot (58b) writes that gichor means "red". The Masoret Hashas, along with other commentaries, says that the two terms were mixed up in Rashi's commentary to 31b due to a printing error. However, perhaps even more peculiar is the fact that Jastrow also translates tzachor as reddish. When I read that, I thought this is an interesting way to end the post - I've found an error in Jastrow. But it's not that simple. There's actually a lot more to this story. Let's continue. Until now, we've said that tzachor means "white". This is the opinion of Rashi, and following him Even Shoshan and Daat Mikra. Perhaps the earliest source is the Targum on Yechezkel 27:18, who translates the phrase as ועמר מלת כבינא, Ibn Janach here says that the word כבינא means "white", as found in Shabbat 54a, and mentioned explicitly by R' Sherira Gaon. Kaddari says tzachor means "yellowish-brown", and quotes a Syriac cognate meaning "to become red". And Gesenius, while defining tzachor as "white", says that the donkeys in Shoftim are actually "reddish with white spots". Following this, many newer translations of Shoftim (such as JPS) have the word tzachor in Shoftim as "tawny", meaning "orange-brown or yellowish-brown color". So how should we understand Jastrow? Well, he quotes a different version of the gemara, which has "לא אוכם ולא צחור", so he translates it as "neither dark [ocham] (ugly) nor reddish [tzachor] (exceedingly handsome)". Here the contrast is not between white and red, but rather dark and red, which allows him to remain more faithful to the modern understanding of the word (since otherwise gichor and tzachor would be very close in meaning).. In the entry for tzachor in Ben Yehuda's dictionary, Tur-Sinai is quoted as going even further, by bringing yet another version of the gemara, that has "לא אוכם ולא חיור" (neither dark nor pale - chivver), saying the inclusion of tzachor at all was a printing error. So how do we resolve this issue? Are the donkeys red or white? In fact, this isn't even the only time where it's unclear whether a biblical Hebrew word can mean red or white - see this page for further examples. I think the answer can be found on footnote 38 in this book, which quotes Hartley's book The Semantics of Ancient Hebrew Colour Lexemes. Hartley says the donkeys were "shiny light grey, possibly with a tint of red", but more importantly writes that "the term here many denote luminosity rather than hue". So the question of white or red isn't that relevant - the word tzachor perhaps originally meant "shiny, glittering, gleaming". This fits the verses we quoted above, and best fits the related roots of צהר and זרח. Sometimes it could mean white, sometimes red - both those colors shine much brighter than the darker hues. The problem, of course, is that this explanation doesn't lend itself easily to translations of the Tanach. It's possible that the verses did refer to one color or another, but no translation can be consistent and still succinct. However, luckily for you dear readers, I have no such limitations! 1, Yaakov Etsion, in his extensive article here about tzachor (in Hebrew) quotes one of my favorite responsa of the Rashba (1:12), where he uses the substitution of Tzochar and Zerach, as well as others (including those in the Ten Commandments!) as proof that the Torah is more concerned with concepts than with words.